Graffiti Styles! 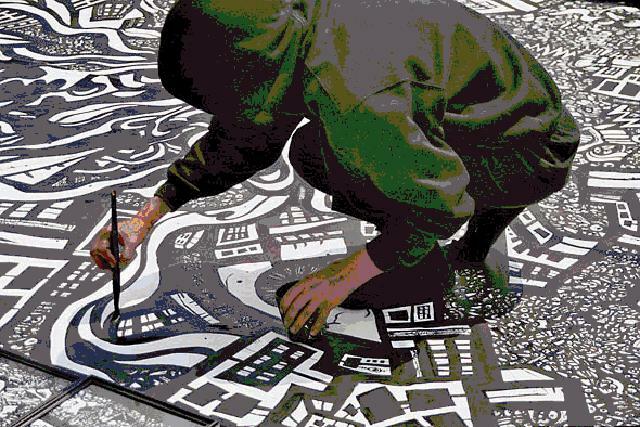 The City is a Giant Gear propelled by all the unusual characters spiraling through it! Monsters, Superheroes, Kids and Commuters attempt to co-exist at the chaotic concrete carnival of the downtown core. Strange technologies assimilate the minds of unsuspecting denizens while masked men and musicians use mythical powers in retaliation! Like the trees that stood before them the brick buildings stand idly by, silently mocking the busy bodies below. Yet despite their wise humors these ancient structures remain powerless, waiting to be wiped out by their own impenetrable glass descendants and the dreaded stucco beast called the box store. Can the balance between people, machines, nature and consumer goods be sustained or is the city truly committed to an inevitable annihilation? 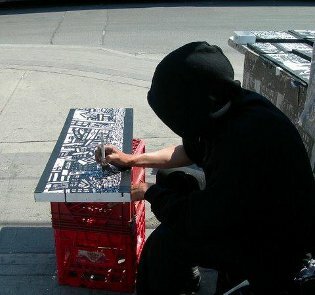 I started setting up my graffiti styles in front of the Black Bull Tavern on Queen Street West in the early spring of 2007. 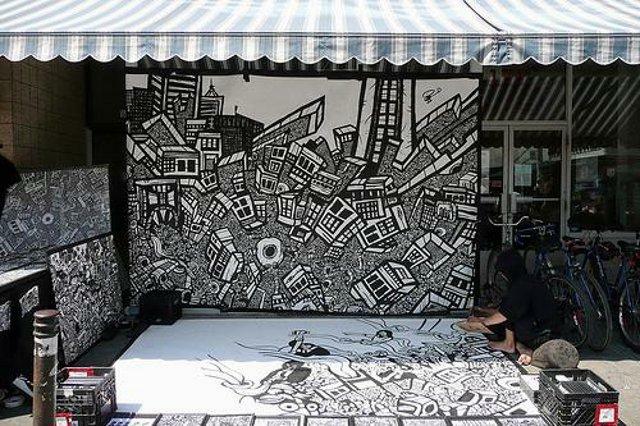 By this time my street art display included a 12 x 15 foot performance drawing, buckets full of small prints and a table set up featuring hand painted canvases, screen printed t-shirts and self published graphic novels. What had started out as a toolkit packed with cardboard sketches (2004) now overflowed a large shopping cart and required a small storage garage. The summer weather was immaculate and I was able to work full time without interruptions. For the most part I made smaller paintings while talking to people throughout the week days and did the live mural painting performances on the weekends. 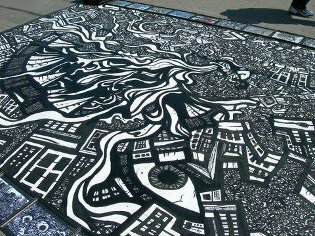 Every Saturday I drew a 12 x 15 ft. comic book cityscape in front of huge crowds on Queen Street and on the last Sunday of each month I did similar performances at the Kensington Market Festivals. The live paintings generally took between 3-5 hours each to create and by the end of the season I’d finished 27 of these massive artworks. In addition to the scale and pace of my graffiti styles, I also became more aggressive when it came to telling stories. I really enjoyed sharing the weird tales and hidden parables with the crowds and especially with the young kids. I remember giving readings of my comic books to groups of amazing children and on many, many occasions the children would explain the stories to me. One time in particular stands out in my mind. 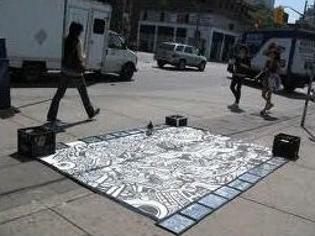 There was a group of teens and adults crowded around one of the works. They were trying to decipher the meaning of the large mural but no one seemed to have any clue. After a few minutes a young girl stepped out from behind everyone’s knees and spoke out loud and a little frustrated” It’s a Saxophone player!” The young girl and I both giggled because we had known all along but there was a lot of forehead slapping and ashamed sighs as the image became instantly obvious to everyone else. 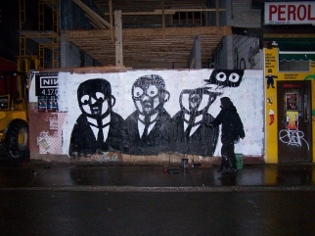 2007 was by far the most interesting year practicing graffiti styles as a Toronto street artist. It seemed as though everything I’d set out to do was coming together. 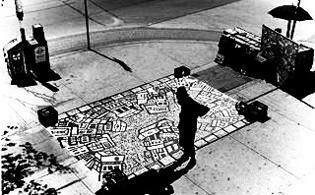 When I started drawing years earlier I’d guessed that the only way to understand the city was through public investigations and interventions. 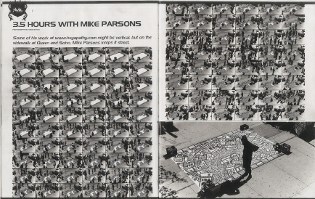 My goal was to interact with the people, the concrete, and the collective unconscious of the city with the hopes of educating myself and possibly even contributing something positive. 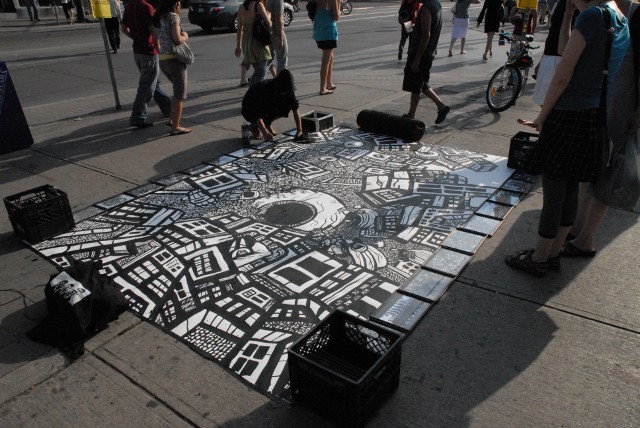 Sitting out on Queen Street that summer throwing ink around I found myself doing just that. 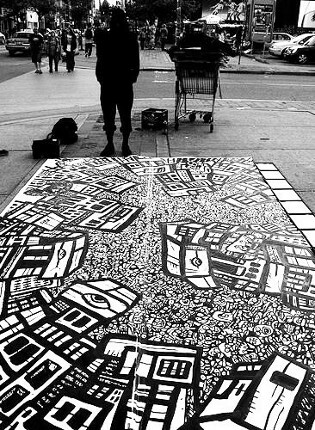 I was creating works, sharing stories and affecting the city for what I hope was the better. That summer I continued to meet people from all over the world and of all walks of life. I was truly immersed in the metropolis’ routines. It is difficult to explain it in words but those days in front of the Black Bull will always be remembered as some the best times in my life.